In your case wipe /devsdb4 till 6 with Gparted. Be very carefull and double check that you’re solely wiping those partitions, otherwise your entire drive will be wiped. Create a Swap partition (swap) 4 GB will be enough. 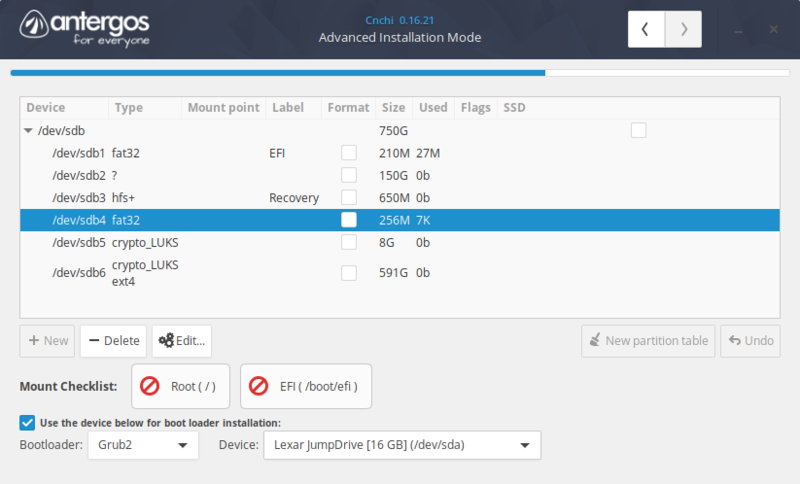 (/dev/sdb5) There are debates about not having a swap partition, but some apps and system tools require a swap partition. Create a Home partiton (/ home) with the rest of your disk space in ext4. (/dev/sdb6) This one will be used for your personal documents, video’s, music etc. To have this one separately is an advantage in case you have to reinstall the system, then your personal files won’t be effected. Choose /dev/sdb to install the bootloader. Now you’re good to go and after install Grub will list Antergos and Macos to boot from. I didn’t see your second post, problably caused by error in connecting to the forum. Do you mean that it doesn’t boot at all? If so then boot the live iso and follow these instructions over here. If it’s the first, then it’s most likely te unusual partiton scheme you have going on. Than the problem is the AMD graphics card. You have to disable it to get to the intel graphics output. To do so read over here. Maybe the solution over here will help you out, just read the whole thread just for you to know what you’re about to going to do and in the last post the user sums up what worked out.